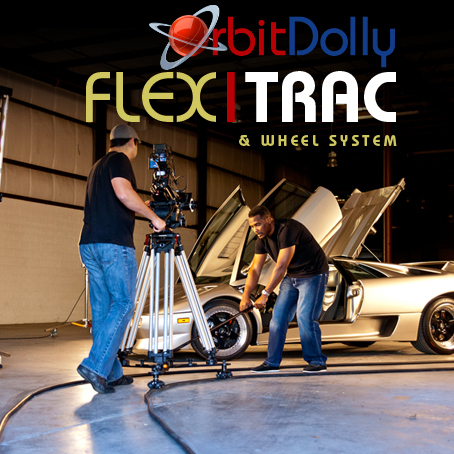 Introducing the Orbit Dolly FlexTrac & Wheel System - see it in action! 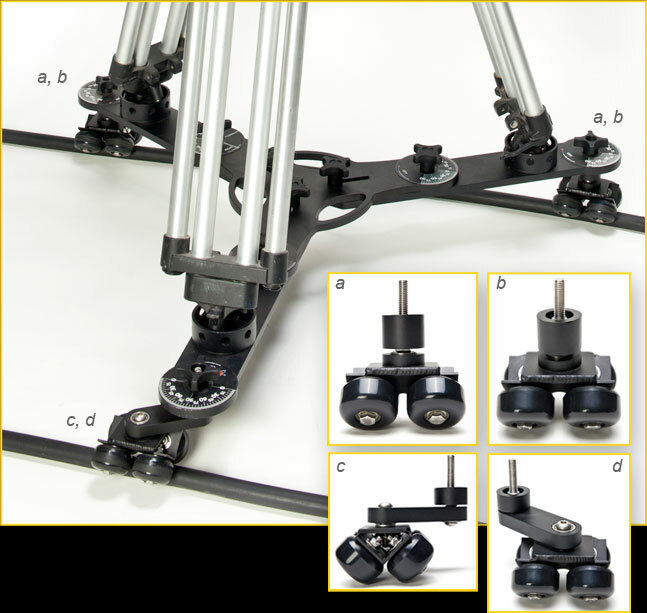 The Digital Juice Orbit Dolly FlexTrac & Wheel System is a highly portable, seamless and flexible track system designed for use with the Digital Juice Orbit Dolly. 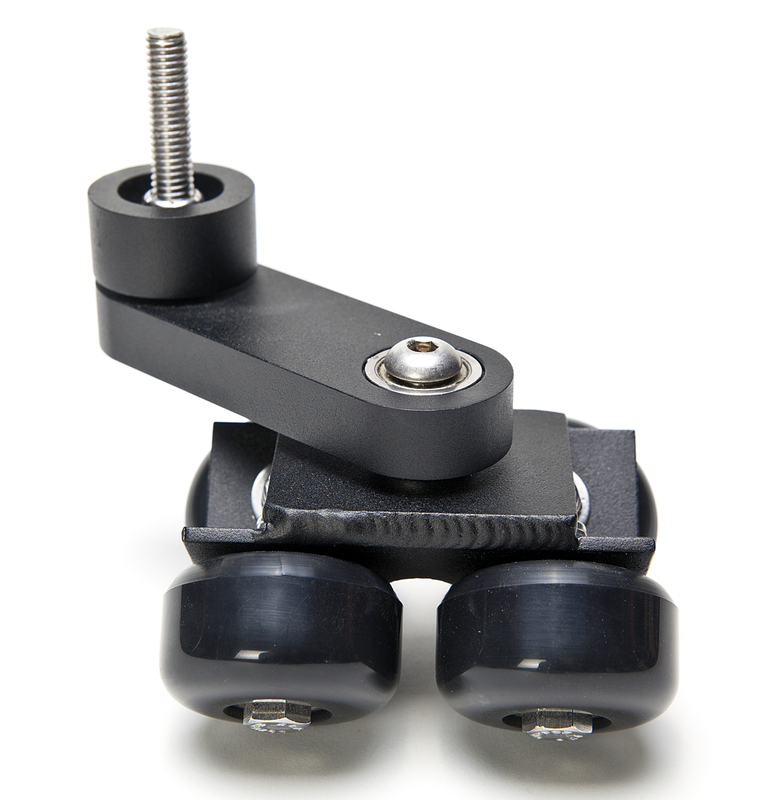 The product includes a 50' roll of flexible but solid rubber cord track plus a set of 3 pivoting wheel trucks which attach to the Orbit Dolly in place of its regular wheels. 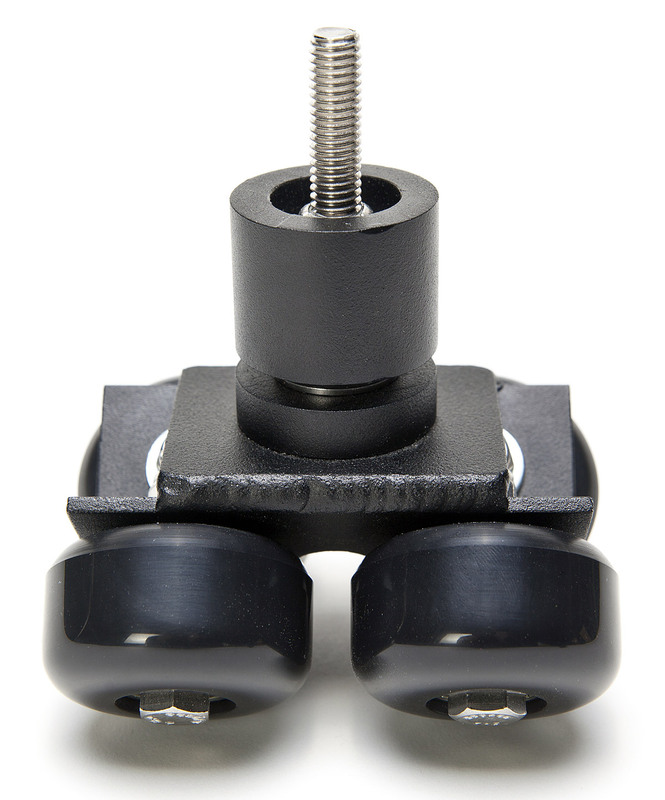 Two of the wheel trucks use a single center swivel to guide the dolly on one side of the track while the third sits on the opposite track and utilizes a 3" floating pivot arm, giving you the ability to track around corners and change directions as many times as you want, while also compensating for any deviation in the track spacing. 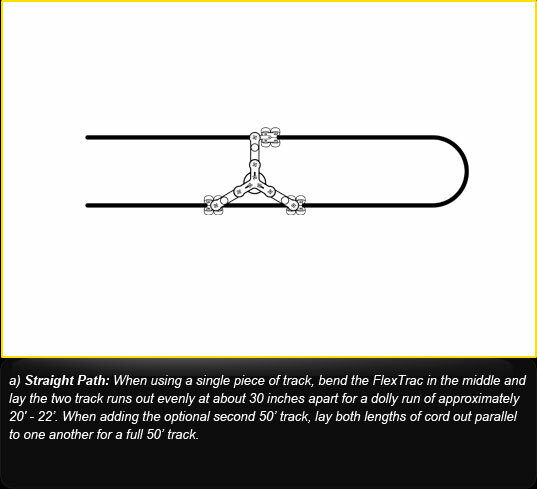 The FlexTrac track can be configured in straight runs or can curve in any radius or direction. 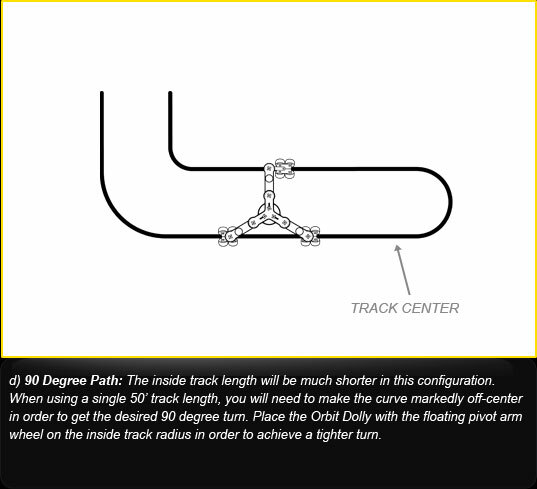 The 50' length of track provided in the kit can be looped to create a 20' - 22' dolly run, or an optional additional 50' section can be purchased in order to create a full 50' track. 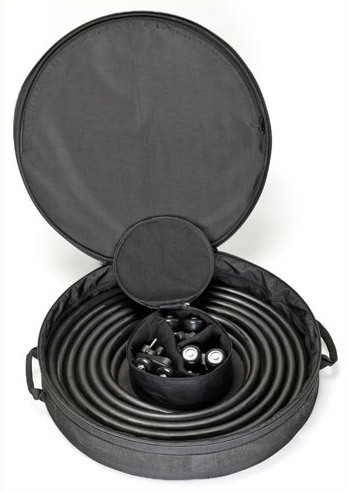 The Digital Juice Orbit Dolly FlexTrac and Wheel System includes a handy carry case that makes it simple and convenient to bring your FlexTrac with you on location. 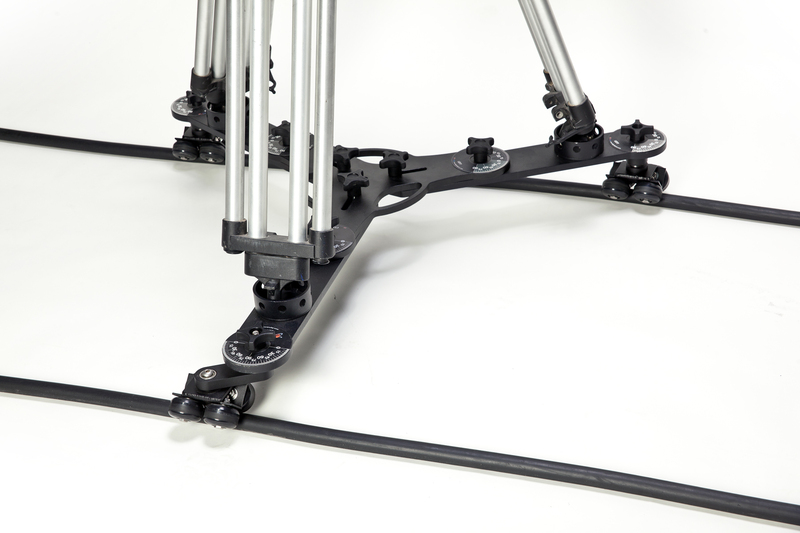 The toolless assembly also means you can quickly remove the existing wheels from the Orbit Dolly, secure the FlexTrac pivot wheels to the chassis, lay your track and start shooting within minutes. 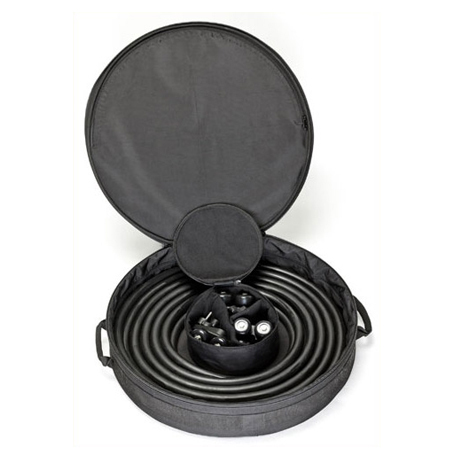 Each 50' section of track rolls up into a 4" diameter bundle and weighs just over 30 lbs, creating unprecedented portability when carried and stored in the deluxe carry bag included with the kit. 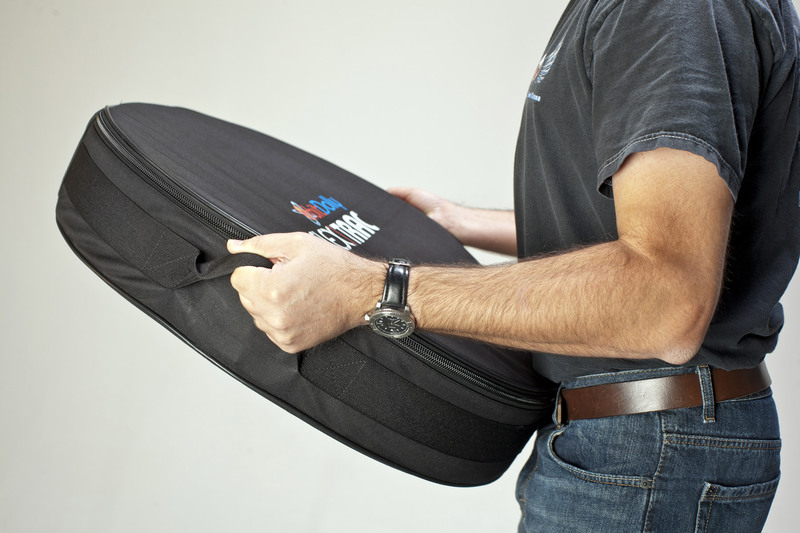 This handy storage and carry case makes it simple and convenient to bring your FlexTrac with you on location. 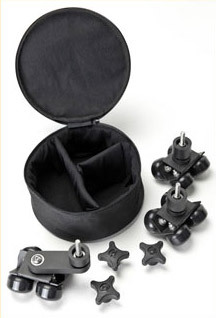 It has two sturdy carry handles and also easily holds the 3 FlexTrac wheel trucks in their own custom carry bag with repositionable velcro padded dividers, keeping them clean and handy for use. The Digital Juice FlexTrac wheel hardware is precision CNC milled from high-grade 6000 series aluminum and finished with a textured powder coat finish to withstand wear and tear for years to come. 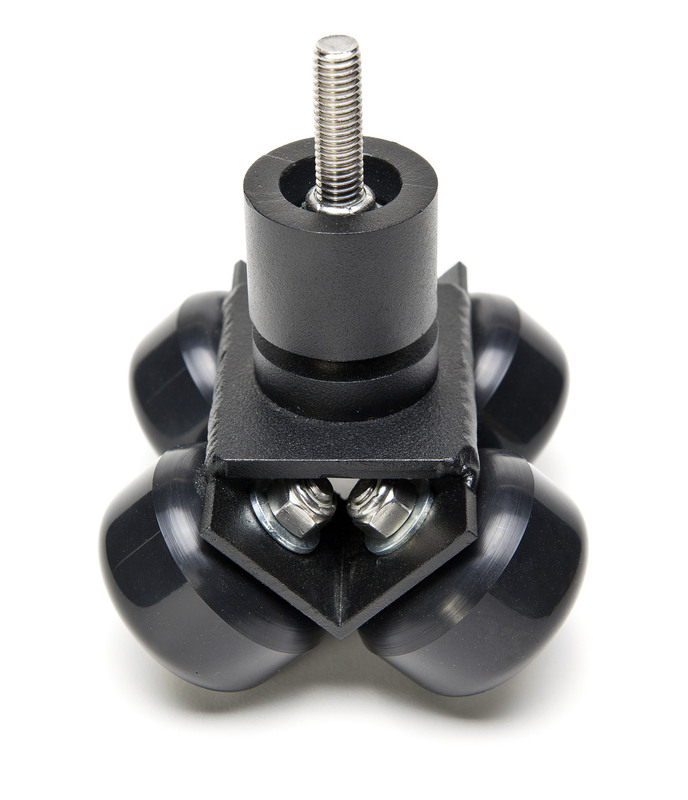 The wheels utilize an advanced pivot system that incorporates 8 sealed steel ball bearings. 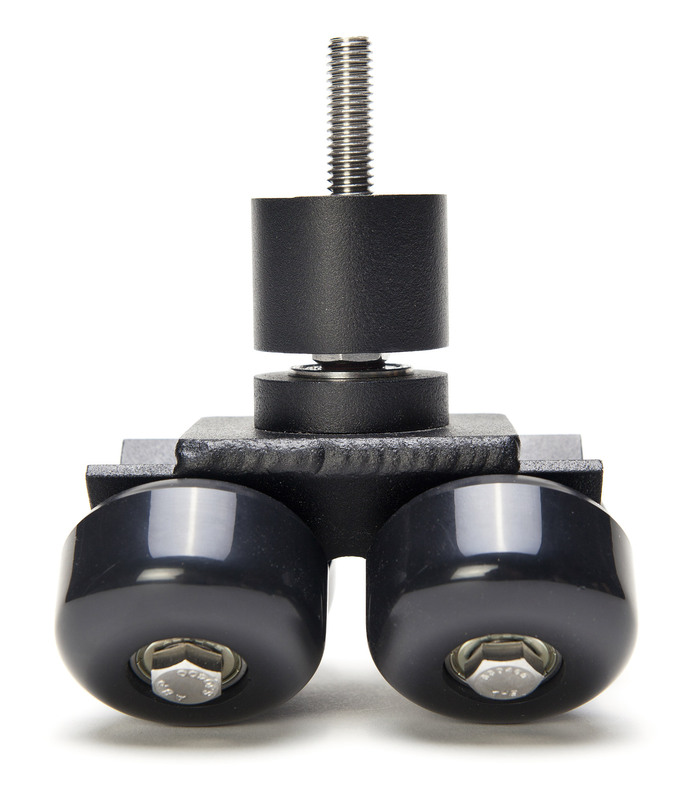 Two of the wheel trucks (a, b) use a single center swivel to guide the dolly on one side of the track while the third (c, d) sits on the opposite track and utilizes a 3" floating pivot arm, giving you the ability to track around corners and change directions as many times as you want, while also compensating for any deviation in the track spacing. 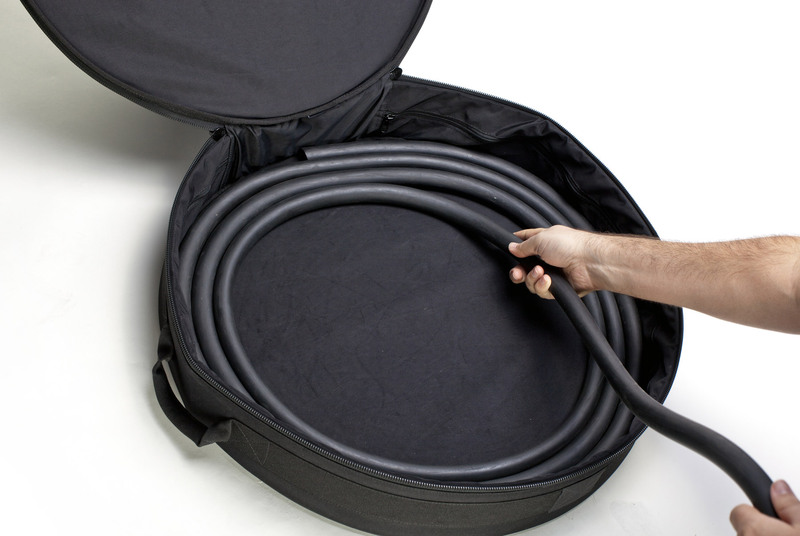 The durable rubber track has a 25mm diameter, giving you maximum flexibility and strength while still being lightweight for optimal portability. 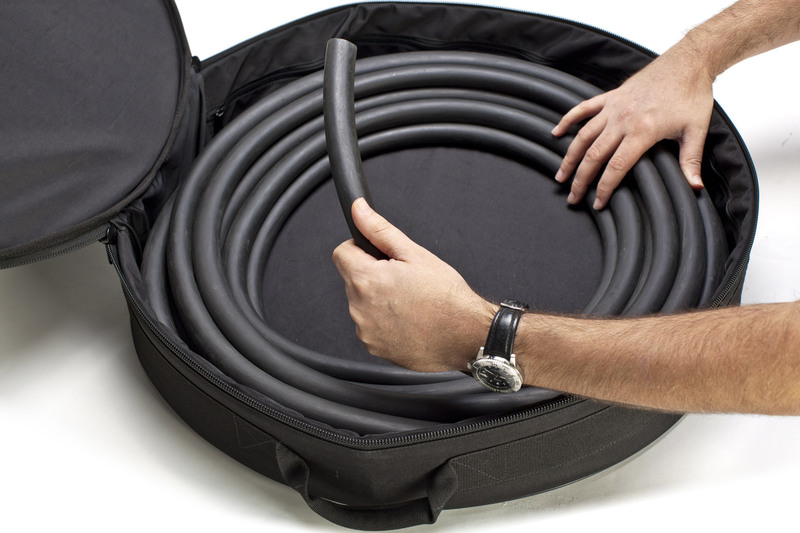 The flexible rubber material used for the track retains little or no memory from being stored in a coiled position and can therefore be placed in your desired position straight from the bag. 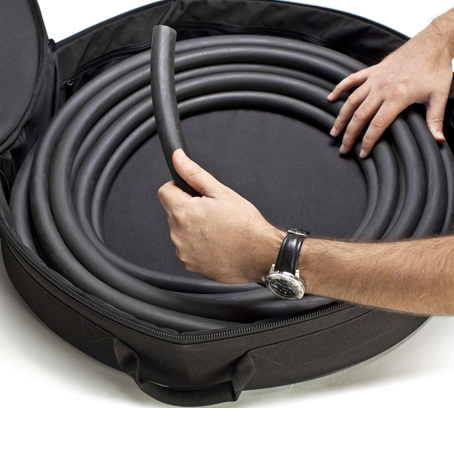 When putting the FlexTrac into the provided carry bag, you should lay the track out straight and pull it towards you as you coil it into the bag. Don't try to roll it into a bundle and then put it into the bag. 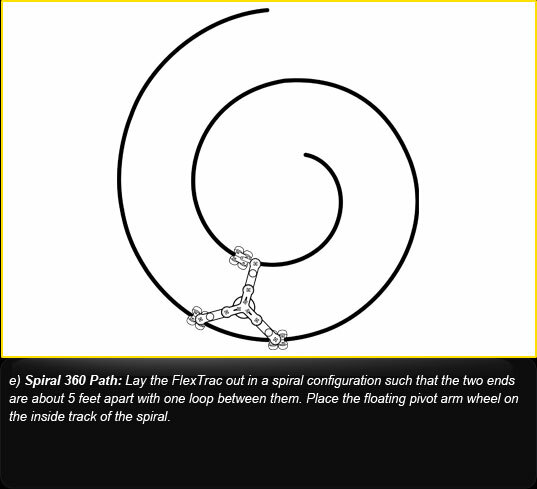 The FlexTrac track is flexible enough to curve into a 90° turn with a 2.5ft radius. 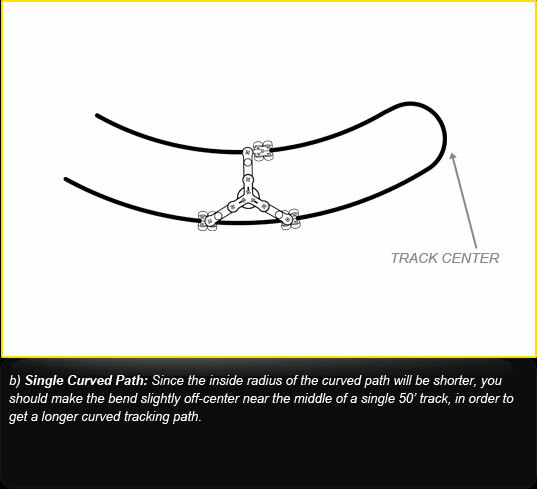 It can also be used for a variety of straight, curved & round tracking maneuvres. 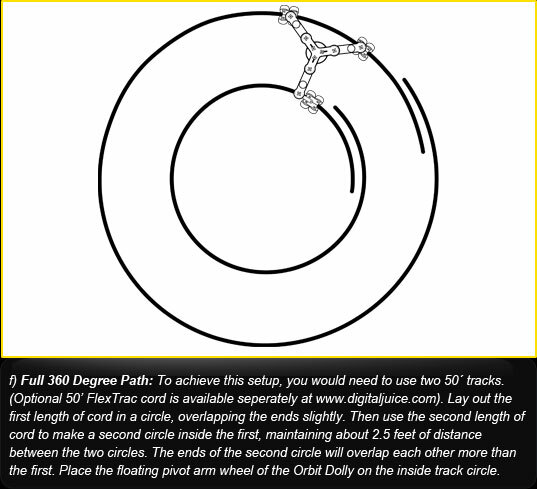 Note: The Orbit Dolly is uniquely designed to achieve a perfect 360 degree circular path without the use of flexible track and using just its regular wheels. However the FlexTrac can be used for the same purpose if desired. 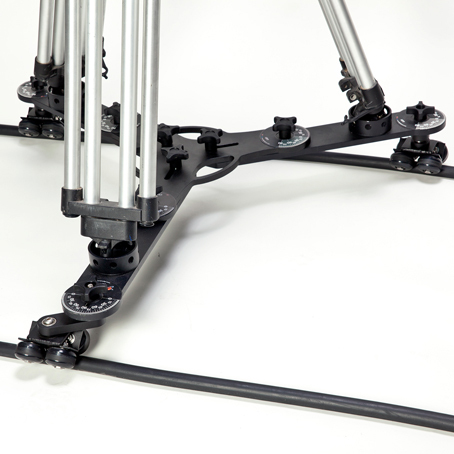 The versatile Orbit Dolly FlexTrac system can make getting the perfect tracking shot on location supremely easy. 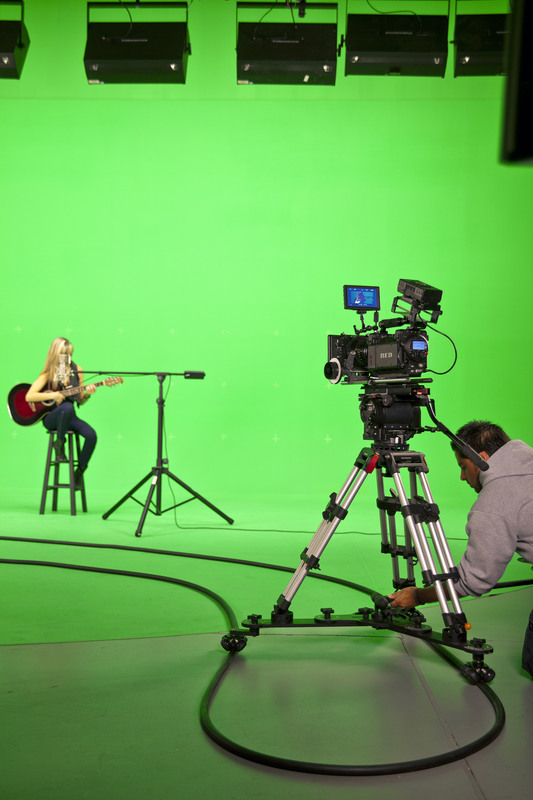 Because of its lightweight portability and ease of use, you can be up and running with even the most complex shot in minutes - whether shooting in studio or in tight indoor spaces. You can even take it outdoors to get action shots normally impossible to achieve without much more expensive equipment. 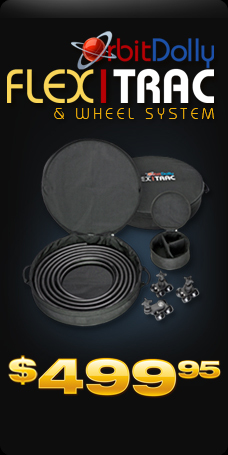 Track Cord Diameter: 25mm / .98"
If I want to put my Orbit Dolly in Tabletop mode, can I still use the FlexTrac Wheel System? Yes, and because this will also mean a reduced space between the tracks, you should get a slightly longer tracking distance when using a single cord for the track. 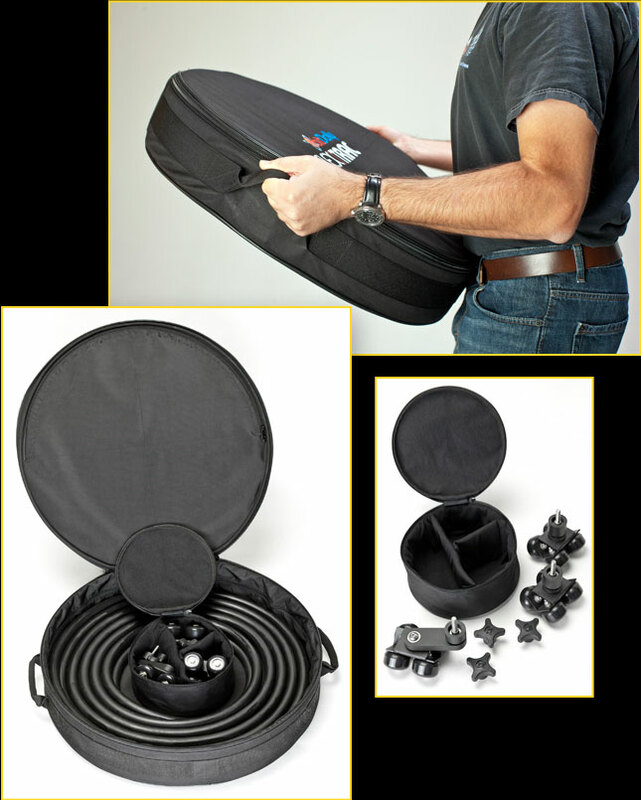 Can I use my Orbit Dolly FlexTrac in the grass? 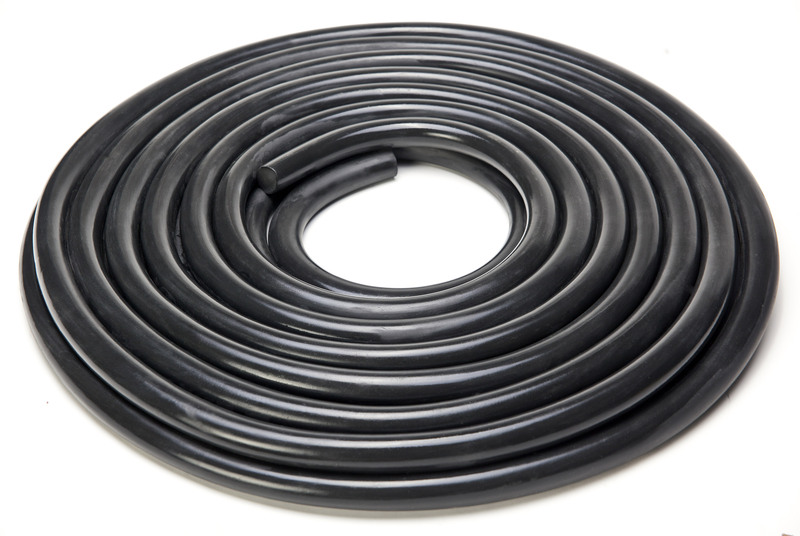 The FlexTrac rubber cord is not designed to be laid on surfaces that are not somewhat level and smooth. 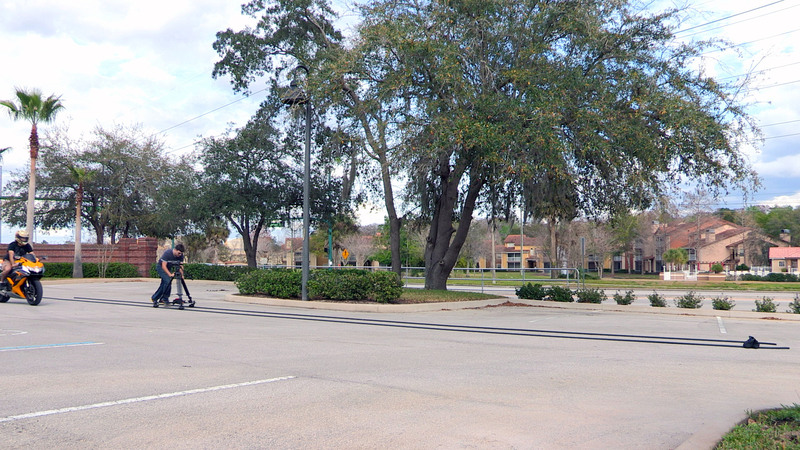 To achieve a straight run in a grassy environment, you can use PVC pipe with the regular Orbit Dolly wheels. 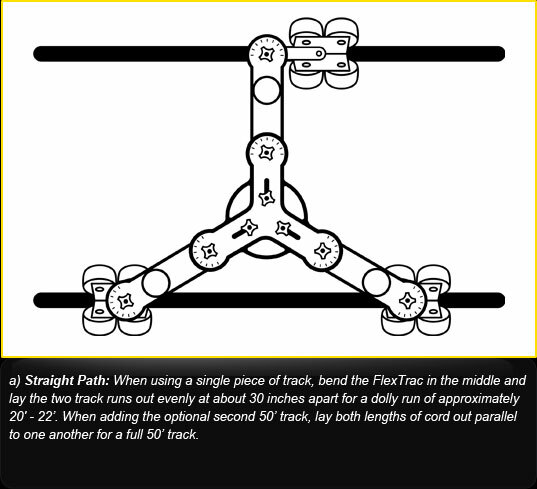 Are there any special care instructions for the FlexTrac System? As with any piece of equipment, you should keep the FlexTrac track and wheels clean and free of any dust, dirt, or debris in order to maintain a smooth surface. The track should not be dragged over rough surfaces such as asphalt which can damage the rubber and cause irregular spots. 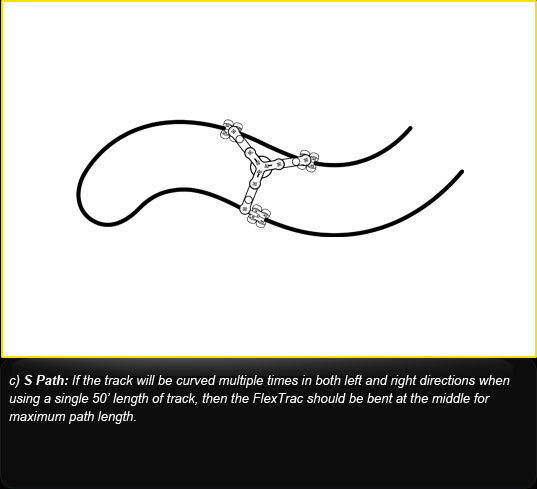 Also try to avoid getting kinks in the track when coiling and uncoiling it, in order to avoid damaging the rubber cord. 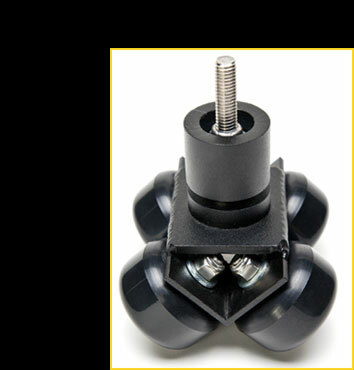 Since the wheel truck pivot system uses sealed steel ball bearings, there is no need to apply oil to these, but the wheels can be wiped clean with a damp cloth if they get dirty. 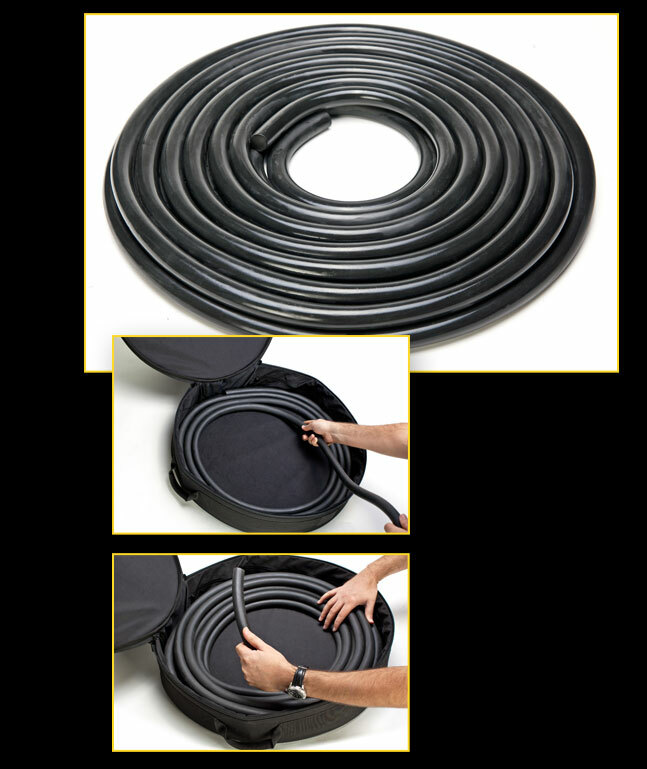 Track Cord Diameter 25mm / .98"
The FlexTrac track is flexible enough to curve into a 90� turn with a 2.5ft radius. 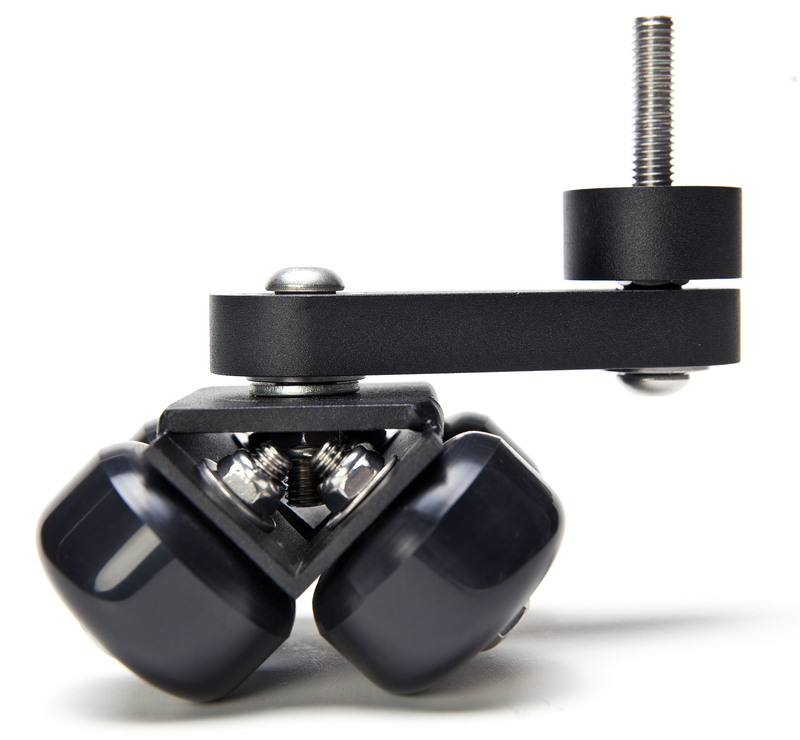 It can also be used for a variety of straight, curved & round tracking maneuvres.